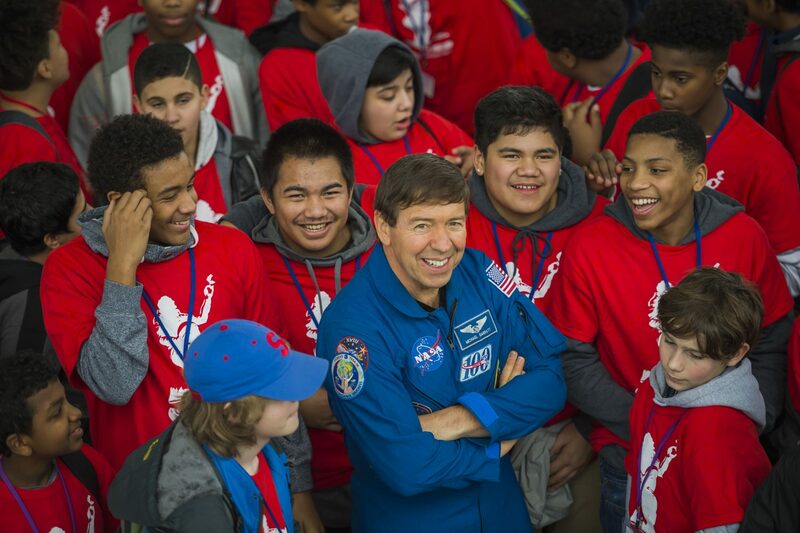 Astronaut Michael Barratt chats with participants in the Michael P. Anderson Memorial Aerospace Program’s day-long event at the Museum of Flight in Seattle, Wash. on Feb. 4, 2017. Funded in part by Alaska Airlines, the program enables underserved children in grades 6-8 to learn about careers in science, technology, engineering and mathematics and participate in the museumÕs educational flight and aerospace programs. Sara Zaki used to think she’d like to be a doctor when she grows up. That was before she spent three formative middle school years as a Michael P. Anderson Memorial Aerospace Program scholar. Zaki spent three years in the program, which was created in 2008 to honor the memory of astronaut Michael P. Anderson. Anderson, a Spokane, Washington, native, was killed 2003 in the Space Shuttle Columbia disaster. 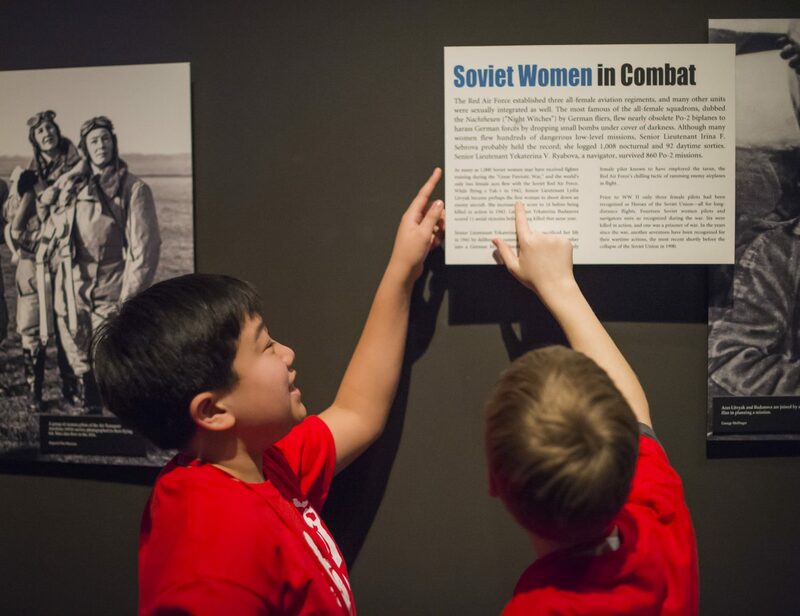 The program is run by a board of volunteers and features six events each year, the first of which is hosted by the Museum of Flight. The goal is to reach underrepresented youth of color across the state and inspire them to dream bigger about the future. While the target audience is underserved children of color, the program doesn’t turn anyone away. 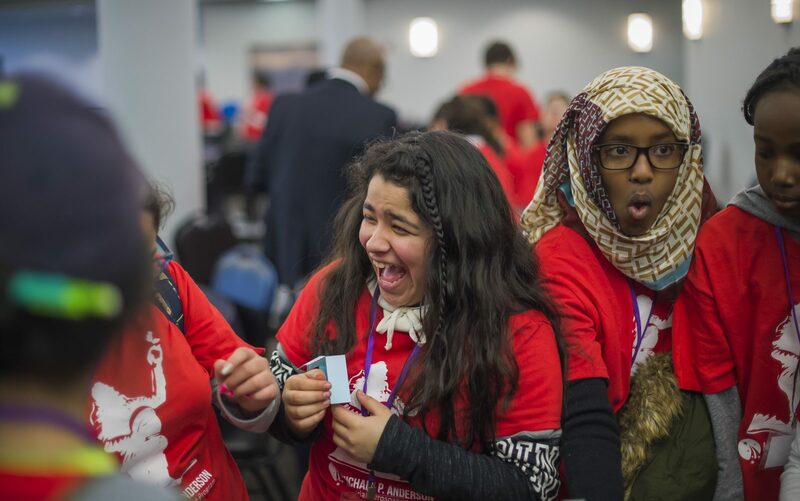 All students have to do is sign up, and if they’re willing to commit to the work and the time, they’ll enjoy up to three years of STEM activities and mentorship – for free. Saturday marked the kick-off of this year’s program. 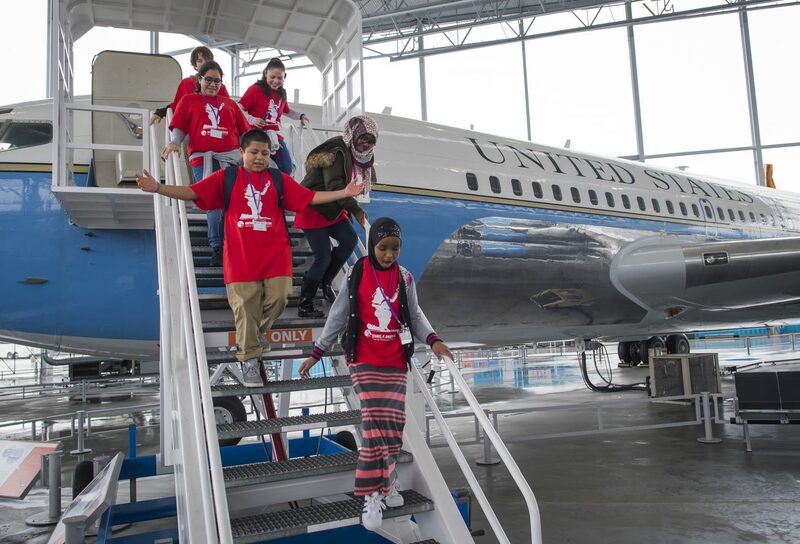 Nearly 200 middle school students spent the day rotating through different activities at the Museum of Flight. 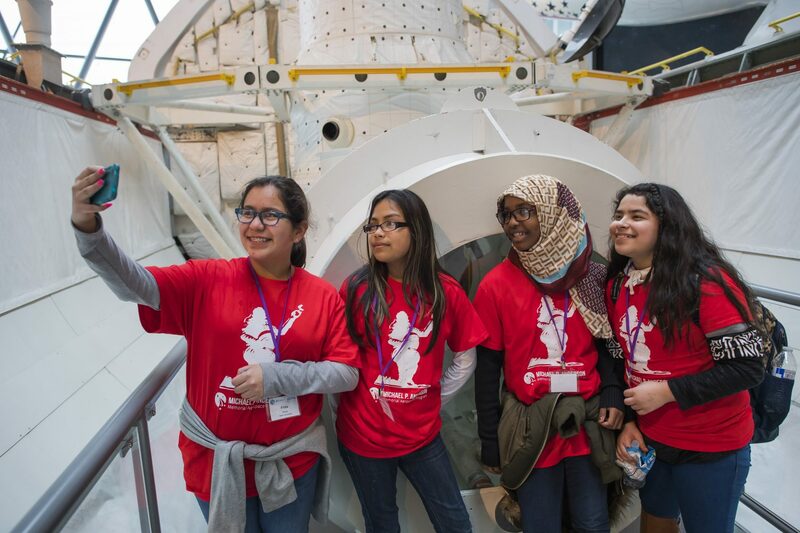 They built robots, learned about the principles of aerodynamics and explored the museum’s historical galleries, before meeting a real, live astronaut: NASA’s Michael Barratt. Astronaut Michael Barratt poses for a group photo with participants in the Michael P. Anderson Memorial Aerospace Program day-long event at the Museum of Flight in Seattle, Wash. on Feb. 4, 2017. Funded in part by Alaska Airlines, the program enables underserved children in grades 6-8 to learn about careers in science, technology, engineering and mathematics and participate in the museumÕs educational flight and aerospace programs. Participants in the Michael P. Anderson Memorial Aerospace Program tour the Museum of Flight in Seattle, Wash. on Feb. 4, 2017. Funded in part by Alaska Airlines, the program enables underserved children in grades 6-8 to learn about careers in science, technology, engineering and mathematics and participate in the museumÕs educational flight and aerospace programs. Participants in the Michael P. Anderson Memorial Aerospace Program watch whirligigs take flight during a day-long event at the Museum of Flight in Seattle, Wash. on Feb. 4, 2017. Funded in part by Alaska Airlines, the program enables underserved children in grades 6-8 to learn about careers in science, technology, engineering and mathematics and participate in the museumÕs educational flight and aerospace programs. 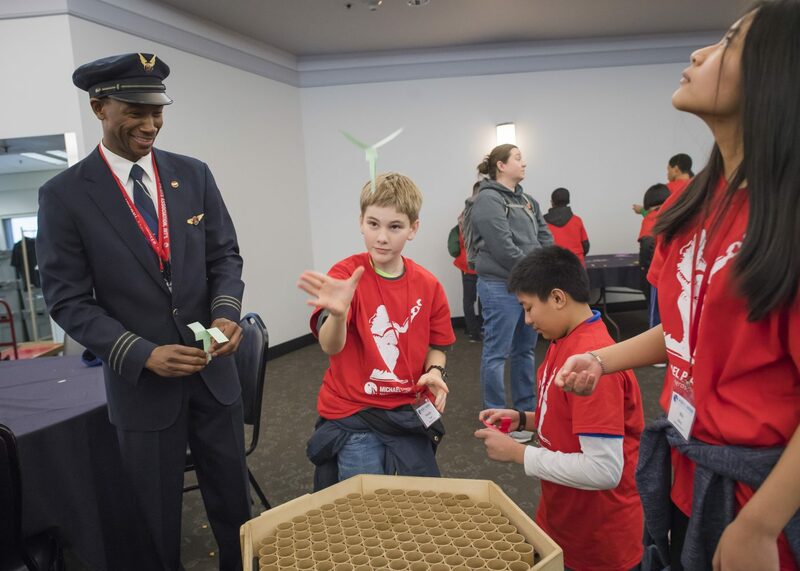 Alaska Airlines First Officer Marcus Williams and participants in the Michael P. Anderson Memorial Aerospace Program watch whirligigs take flight during a day-long event at the Museum of Flight in Seattle, Wash. on Feb. 4, 2017. 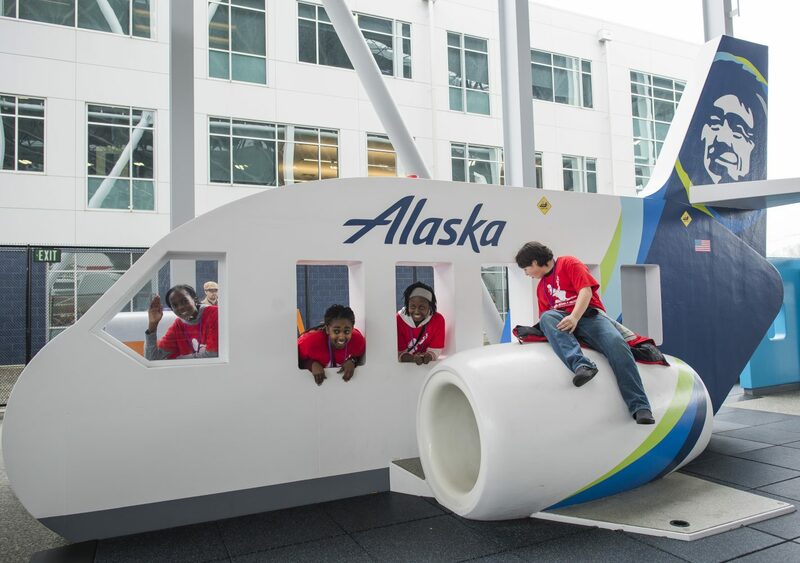 Funded in part by Alaska Airlines, the program enables underserved children in grades 6-8 to learn about careers in science, technology, engineering and mathematics and participate in the museumÕs educational flight and aerospace programs. 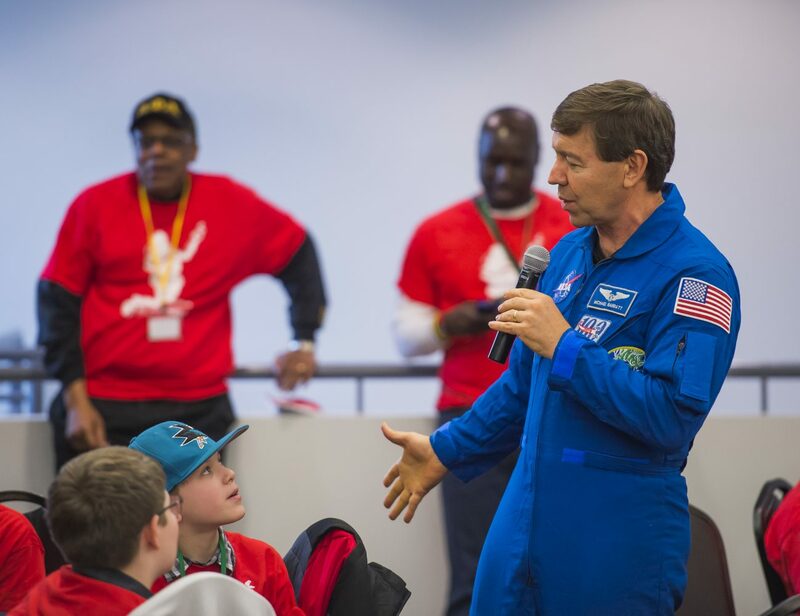 Astronaut Michael Barratt fields questions at the Michael P. Anderson Memorial Aerospace Program day-long event at the Museum of Flight in Seattle, Wash. on Feb. 4, 2017. Funded in part by Alaska Airlines, the program enables underserved children in grades 6-8 to learn about careers in science, technology, engineering and mathematics and participate in the museumÕs educational flight and aerospace programs. Volunteer pilots, flight attendants and flight simulator engineers walked among them, clad in full uniform. Many of the volunteers are also people of color, who believe in the importance of giving children mentors to look up to who look like them. In addition to STEM subjects and career mentoring, the program also enforces strict behavior standards: no disrespect, no electronic devices, hard work. Limes made a point Saturday to stop and introduce himself to each scholar, asking their names and what they’re into before transitioning into a little friendly interrogation. Limes has been involved with the program since the beginning, when he was invited to volunteer by a fellow Alaska pilot. Like many of Alaska’s community outreach programs, this one began as a grassroots effort – a group of passionate employees began volunteering for a cause they believed in, and invited the company to join in as a partner. Over the years, Alaska has contributed more than $150,000, and supported the employee volunteers who keep it running. “We’ve all had someone who was there for us as we were climbing the ladder, and it’s our responsibility to turn around and give it back once we’re successful,” says Alaska first officer Marcus Williams, in his second year of volunteering with the program. He’s also involved with Aviation Day, an annual, employee-organized event designed to expose students to potential careers in aviation. 4 comments on "Michael P. Anderson Memorial Aerospace Program exposes youth to life’s possibilities"